Choosing tile for your kitchen or bathroom remodeling project can be a challenging, time-consuming, and exciting endeavor. After all, your tile is a visual focal point for any design. It can add an elegant, neutral or whimsical element to your project. However, when selecting tile, you should give equal importance to the grout color you choose. Different grout colors can produce very different effects, from bold, dramatic contrasts to smoothing out your overall tile design and creating a cohesive look. Today, you have a wide choice of colors, so make sure to spend some time exploring all of your options. You're not just limited to white and gray anymore. Image the look of crisp white subway tiles with aquamarine blue grout, stunning! While there are almost endless color choices to make when it comes to grout, most can be classified into three categories; dark, light, and neutral shades. Here are some tips, guidelines, and ideas for choosing the perfect grout color for your kitchen or bathroom tile design. The white penny tile stripe complements the white shower base, and the penny shape is evident because the dark grout used contrasts with it. While black is the darkest color available, every color has a range of shades from dark to light. For example, blue grout can come in a strong, bold ultramarine or a light robin's egg pastel. The more “intense” a color, the more likely it is categorized as “dark. The tendency to pick dark colors comes from their ability to hide dirt and require less maintenance. However, darker grouts can discolor over time if you use cleansers that fade it. “Light” grout color choices are closer to the white end of the color spectrum. One benefit of light grout colors is that they will not fade over time, however, they don't hide dirt as well as darker shades. Lighter colors can give your tile work a more cohesive look, for example, classic white subway tiles with white grout provide the kitchen with a seamless, uniform look. White is not only considered a “light” color it also falls into the realm of neutrals, along with lighter shades of gray and tan. A neutral color doesn't make a statement, it recedes into the background. Neutral colors do not include colors that provoke a reaction, for example, light shades of yellow, pinks, blues or oranges. Gray is currently the trendiest grout color and has multiple applications from contrasting to unifying a design. Neutrals have a soothing effect regardless of whether they contrast or match the tile. Grout Color: Match Or Contrast? The grout in this kitchen was designed to contrast. Note that the white field tile uses dark grout to make it “pop” and that the grey tile behind the range uses white grout to also “pop”. Furthermore, the dark grout is the color of the grey tile, and the light grout is the color of the white tile. Depending on the effect you desire, your grout choice can either match or contrast your tile choice. If you choose a visually elaborate patterned tile and you want it to be the focal point of your design, matching the tile and grout color is the way to go. Matching prevents the eye from being distracted from the pattern grout lines can create. This style works best with neutral tile colors, especially white tile when you're seeking a fresh, clean look. Remember, lighter grout colors will show stains, dust, and dirt and will require more frequent cleaning to look its best. Matching also works great for other colors and materials, especially glass, and colored porcelain. For example, using a charcoal gray glass subway style tile with a softer gray colored grout can create a unified look. The grout color doesn't have to match exactly, but keeping it in the same color family achieves the same type of effect. Note the subtle contrast between the tile and grout in this arabesque tile backsplash. The color of the grout matches the color of the tile almost perfectly, and it is only the difference in texture which reveals the difference. As you view the tile further away, the grout distinction fades. Contrasting grout and tile color is the best solution if you're looking to make a dramatic statement with your design. 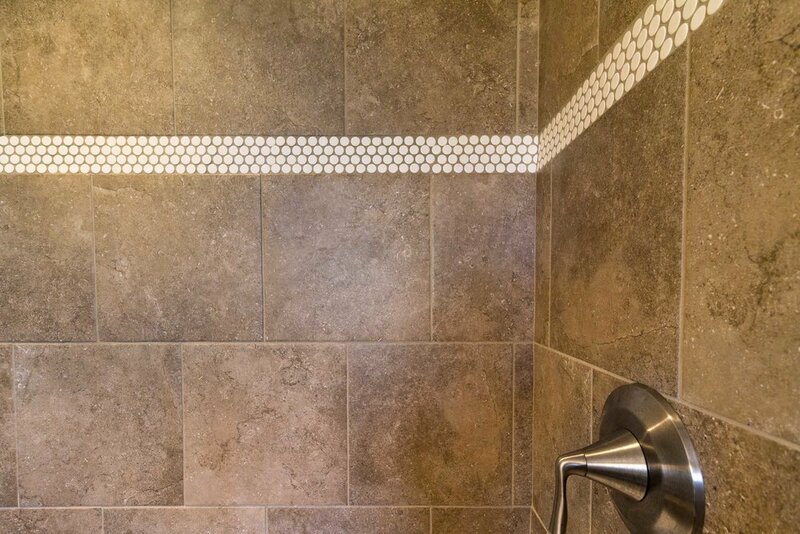 The contrast between your tile color and the grout color will emphasize the pattern and layout of your tile creating a visual focal point in your design. For example, using a penny mosaic, or larger key shaped tile with a contrasting grout can be a visually stunning effect. Dark grout is a great way to add pizzazz to a standard tile, for example, clean white subway tiles with dark gray or black grout can prevent the sense of sterility and add a level of depth and dimension to your space. For a more dramatic effect, consider spacing the tiles slightly wider. A couple of things to remember when using light tiles and darker contrasting grout. Dark grout is easier to keep clean, but it's important to remember that dark grout can stain the tile during application, especially if the tile has any crackle in the glaze. If you go this route, make sure to properly seal your tiles to protect it from staining. Test a few coats of sealer/grout release to determine the proper process, or consult with your contractor or the manufacturer. They can explain all of your options. Choosing the right grout color is as important as picking the perfect tile. The two work together to help you achieve the ideal look for your kitchen or bathroom. Regarding design, whether you choose to go with contrasting, matching, or neutral grout depends on the look your going for, and the amount of time you're willing to spend cleaning. Whatever you choose, today you have a more extensive range of choices than ever before for achieving your creative vision. 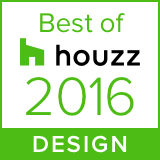 If you have questions, give the experts at Degnan Design, Build Remodel a call. Our design team can provide you with advice on the perfect color combinations to meet your needs and match your vision. If you're planning a kitchen or bathroom remodeling and you live in the Madison, Wisconsin area, give us a call!